I watch a lot of Youtube and Vimeo videos, gathering new information, learning the newest techniques when it comes to using digital mediums. Recently I’ve seen and heard quite a bit of digital artists telling young artists just starting out “don’t skip using traditional mediums.” Hmmm, why is that? After all isn’t drawing on a tablet with pressure sensitive pen pretty much the same as a pen/pencil to paper or paint to canvas? In a lot of ways it can be and in other ways not at all. There is no perfect undo when painting with traditional mediums. No layers, they are all flattened in as soon as a new layer of paint or varnish or pencil mark is put on top of another. No distort, perspective, warp, or liquefy tools either. But there are reasons why it is important to use traditional medium. First off, digital paintbrushes, pencils, and filters are set up to mimic the traditional tools. Without understanding how the traditional ones work one may not know why they can’t achieve a certain look or feel they want in digital. To use traditional mediums is to learn to make your own choices about the piece; you make the decision of the brush strokes, you mix the paint color, and blend them together. Digital allows you to go back and color correct, warp the skewed bottle into the right position, put the building into the right perspective if you are a little off. One of my favorite up and coming digital artists is Noah Bradley. He paints probably 99% of the time on one layer. If finances and room limit you to mostly using digital then I would say to do as Noah does, practice only using one layer. Mix/choose your own colors, only color pick from the colors you have put on you canvas, don’t color pick from a photo or other reference. Stay away from blend modes just stick with normal mode. Don’t use undo. I know it may be automatic, in that case just redo it and fix it the way you would with traditional paint; paint over the mistake, use the eraser but on a low opacity so you have to work at getting rid of the mark, and don’t get rid of it completely as that is rarely the case in traditional work. If you can’t fix it, well, that is the nature of painting, you start over. It is not the end of the world, you certainly are not limited to having to purchase paper and paint again as my generation was back in the day. More importantly you will have learned something valuable you can apply. Start with fruit. 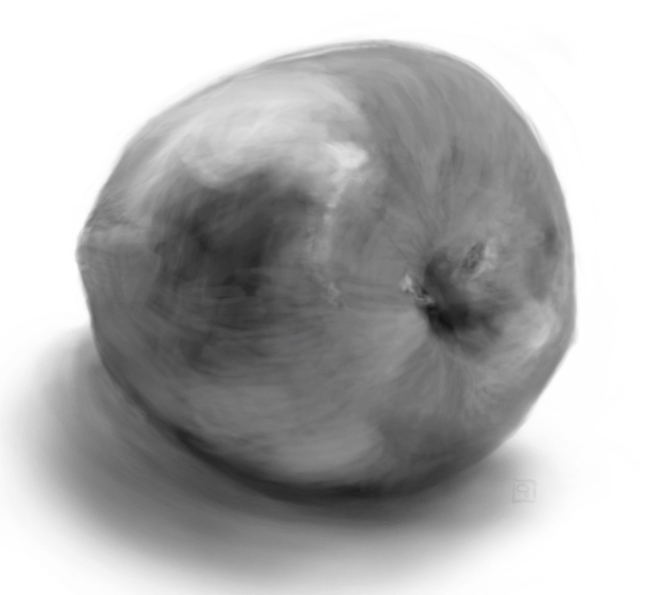 Here is an apple I drew digitally all on one layer. I agree that its important to have a good working ability using traditional medium, as its what digital is based on. If you can do it traditional you will find it pretty easy to work pretty much the same way in digital. As for drawing, its essential one learns to see from the model and be able to lay that contour correct in one line first go. Generally one needs to be standing to get the proper freedom of arm to be able to make the moves necessary. Why first go? well its desired to be able to get to that level so one can get ones feelings into the line, its about hand eye and brain and some other element to work together. drawing is much more then moving the wrist or index finger. For me it pivots at the shoulder all the way down to the finger tips, the wrist and fingers not ridged but not really having much movement, the flow comes from the shoulder. This is not easy on a tablet and one can get too fiddly and cramped. Hey Mario, good to hear from you. Sorry for the late reply. I’ve been having discussions on this particular blog almost everywhere but here. hehehe. As far as tablets I’ve scaled down my work to begin with since I don’t have the full arm movement with my small tablet. And it does take practice to get as loose with this smaller scale using your elbow and wrist, but it can be achieved. However learning to do this on a tablet is going to be much easier if you have used traditional medium on a large canvas or drawing pad where you have developed your muscle memory already. The large tablets and cintiq’s will allow you to get that movement from your elbow and if you have the feel for your tablet also from the shoulder. I also know artist who will do their initial sketch in a larger sketchbook with pencil and scan it in to finish it out as the finer details use the wrist more. Using just your fingers will, I agree, give the work a cramped feel.